Help your dog process and clear damaging toxins that slow healing. The primary herb for detoxing hellacious mite toxins! A sad fact is that when you first start treating Demodex, it typically get’s worse before it gets better. This largely has to do with the huge amount of toxins released when the killing begins into an already toxic, sick pooch. 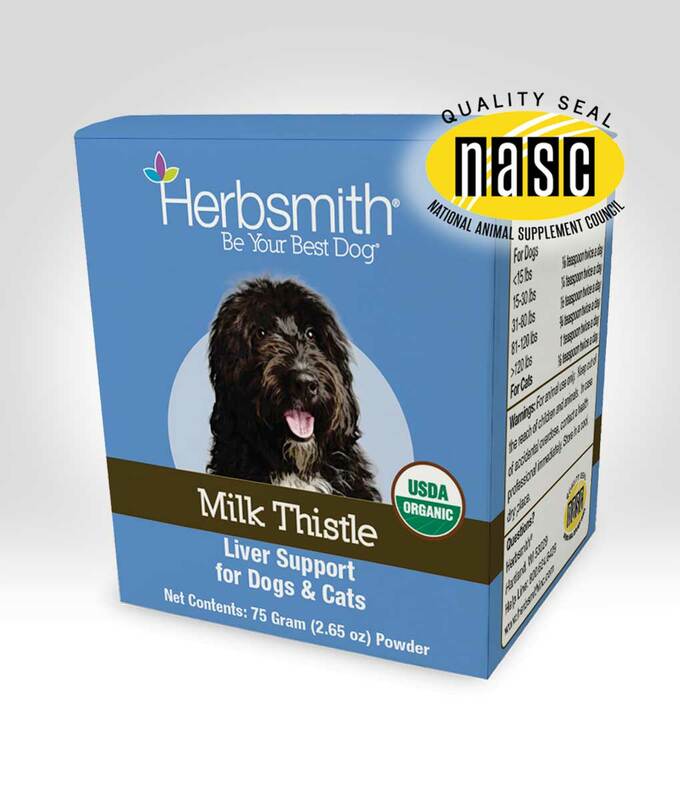 Herbsmith Milk Thistle is the first line of defense for helping your dog process and clear damaging toxins that slow healing, contribute to die-off effect and cause FLC Syndrome (Dr. Mark Hyman coined this: the “Feel Like Crap” Syndrome). Responsible pet guardians also use it to encourage healthy liver function and combat the negative side-effects of toxic buildup from harsh treatments, chronic disease, viruses, bacteria, heavy metals, GMOs, vaccinations, medications (corticosteroids, NSAIDs, antibiotics and anti-fungals are the worst), chemicals, and harmful substances dogs inhale, drink and ingest every day that get trapped in their relatively small bodies. Herbsmith Milk Thistle is something of a miracle herb for the liver. It can cleanse your dog’s body of toxins, protect the liver from future damage, and even has the capacity to help it regenerate after damage has occurred! When selecting supplements for your pet, avoid human grade supplements, and supplemental substances added to commercial pet food. Formulations meant for humans were developed specifically for human bioavailability (the ability to be absorbed by the GI tract). Pets have specific metabolic rates, as well as compounding and delivery requirements unique to their systems. Therefore, so they do best with a customized supplement formulated just for their needs. When selecting supplements for your pet, avoid human grade supplements, and supplemental substances added to commercial pet food. Formulations meant for humans were developed specifically for human bioavailability (availability to be absorbed by the GI tract). Pets have specific metabolic rates, as well as compounding and delivery requirements unique to their systems. Therefore, so they do best with a customized supplement formulated just for their needs. Commercial pet foods containing omega acids, amino acids, vitamins, herbs, probiotics and other health supplements aren’t worth the money. Tests on dog foods claiming to contain their beneficial properties and microorganisms show the manufacturing process destroys them, rendering these additives useless (and sometimes ripe for becoming rancid). By the time the food is packaged and shipped, any benefit is gone.